I just returned from a summer trip to Massachusetts (where I was born and raised) and Rhode Island (where I went to college). It got me thinking about my roots as a New Englander, and as a sort of cultural Christian. Many Jews and non-Jews understand the idea of cultural Judaism: the concept that someone may not be a religious Jew, may be an atheist, and yet may feel defined by the foodways and language and customs of a particular Jewish civilization (most commonly, the Ashkenazi Jewish culture from Eastern Europe that predominates in the U.S.). On the other hand, the idea that one could be a cultural (as opposed to religious) Christian is relatively new and more contentious. Much of what I see (through my Jewish lens) as Christian culture is perceived by Christians (and even non-Christians) to be not ethnic, but simply neutral, or the “American” norm. I understand. Growing up in New England, I was not strongly aware of the Puritan flavor of my culture: it was all I had ever experienced. I could not have described what is unique about New England culture until I went away, and lived in the (more Jewish) culture of New York City, and in a Muslim country, and a Catholic country, and then came back to see New England through the eyes of a visitor. Now, when I return to my childhood home, I see that my parents chose a classic Protestant New England village in which to raise their children, with a town hall graced by a white steeple, overlooking a town green designed for grazing community sheep. As (half) Jews in this context, we were exotic. I grew up subconsciously conforming: wearing Fair Isle sweaters, corduroys, kilts. An interfaith pioneer, my mother agreed to raise us as Jews. But she took advantage of the (less stringent) Reform Judaism of the 1960s, to steep us in (very unkosher) New England cuisine. A wonderful cook to this day, she fed us on clam chowder with bacon, baked scrod, steamed clams, lobster rolls, cornbread baked in a cast-iron mold into the shape of little ears of corn, and B&M Brown Bread with baked beans. B&M Brown Bread, a New England tradition, comes in the form of a cylinder, in a can. “Why would anyone eat that?” recoils my husband, a New Jersey native. Because it’s delicious! The dark, sweet, moist bread contains all natural ingredients straight from the Pilgrim and American Indian larder: rye flour, corn meal, molasses, buttermilk, raisins. You steam the bread in a can, because the Indians and Pilgrims cooked this way, over a fire. My friend Marika from Vermont remembers her mother (a pioneering Episcopal priest) making it from scratch: you can steam the bread in a special cylindrical mold, or with Protestant Yankee thrift, in an old coffee can. My mother served brown bread as part of the traditional New England Saturday supper with baked beans (made with salt pork, mustard and molasses) and hot dogs. Or as a snack spread with cream cheese. You can order the canned bread, along with a lot of other nostalgic New England fare, from the Vermont Country Store. Marika and I were reminiscing with my mother recently about our shared nostalgia for brown bread. 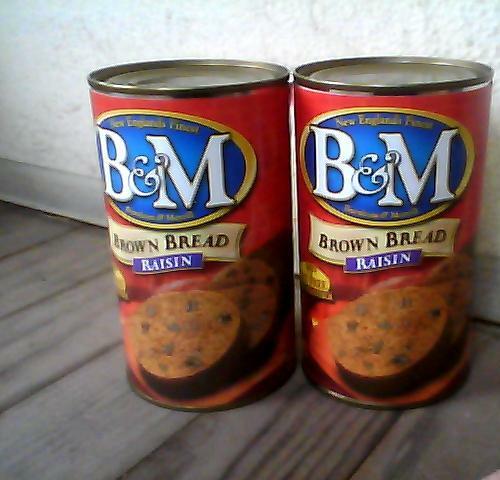 So when I arrived at my childhood home outside Boston this week, my mother presented me with two one-pound cans of B&M Brown Bread: one for me and one for Marika. They filled about half of my rolling carry-on bag, but their mere existence on the earth, in an era of globalization and homogenization, delighted me. I cannot wait for my children to come home from camp, so that I can initiate them into this aspect of their New England heritage. The cans of bread fit right in with my agenda of uncovering and celebrating the deep and specific connections to every culture and religion in their complex backgrounds. With a huge relieved grin, I finally caught on to the joke. I knew that travelers were not supposed to josh with airport security (for instance, about the possibility of using canned brown bread as a weapon). It had not occurred to me that the security officers would allow themselves to play a joke on me. As I zipped the two precious cans back safely into my bag, I was suffused with the warmth of embarassment, but also the warmth of sharing this quirky love for canned bread with the security officer–my fellow New Englander. And I was thankful to my mother for raising us with love for the particularities of this culture, and for my children for existing, so that I can pass this love on. Sue, this is a particularly wonderful blog –especially for me who grew up Jewish in the Boston area. We had Hebrew National kosher hot dogs and Heinz vegetarian beans on Saturday night!!! I love your focus on cultural Christianity. A rich trove! And much more affirming of culturally Christian cuisine than the scene in Woody Allen’s “Hannah and Her Sisters” where he decides he has to become Catholic and so brings home Wonder Bread and Miracle Whip! I began reading up on interfaith as a result of this article on a Jewish/Mormom marriage, and got sucked into your blog post — a good one — because of the connection you drew between religion, location, food, and culture. I’m also a person who went to school in Boston, and transitioned from someone who saw its quaint little traditions as an outsider, to someone who began to see them as his own traditions. And now I’m out in Omaha and itching to go back. Sue, I hope that you are not implying that your mother favored kilts! You always favored Indian print skirts and old Italian felt hats handed down from your grandma….and I mean every day! My cultural Christian heritage is as important to me as is my religious/cultural Jewish heritage and faith. My mother was born/raised an Italian Catholic in Philadelphia; she chose to convert to Orthodox Judaism during World War 2, a few years later she met and married my father, a born Russian Jew. By the time I was born, many years later (I was the “change of life” baby! ), mostly all my Jewish family had died, and so my exposure was mostly to my Italian family. Although they were not very religious as Catholics, they were very, very unassimilated as Italians! Consequently, I grew up in an odd situation: an Orthodox Jewish child, living in an Orthodox community, but almost all my still-living family members were heavily Italian! Because of this I relate very much to the culturally Catholic side of my family. Because most of my Catholic relatives left the church after the changes of Vatican II, the only Catholicism I am familiar with is pre-Vatican II Catholicism, via my family (including an aunt, who was a nun.) I feel just as home in a Tridentine Latin Mass (yes, they still exist) as I do in an Orthodox shul. And I wondered most of my life if I am the only Jew who does! Why wouldn’t Facebook let me link to this? It’s a wonderful blog. I wanted to explain to my friends in Vancouver what Boston Brown Bread is. Thanks. I have gotten your book (Being Both) from the Vancouver Public Library, and look forward to reading it. I suspect the problem with Facebook was some stupid algorithm linking words that name different religions and different colors and making assumptions that it comprises a set of rude posts. I found your site because I was looking for a photo of Boston Brown Bread in a can (people here have never seen it, although we can buy it across the border in Washington State), but I am also very interested in the idea of dual religions (personally I was brought up Unitarian-Universalist near Boston, specifically First Parish in Concord, but now I’m finding myself feeling spiritually empty or at least unprepared for the end of life, so going back to Christian roots, though reluctant to give up entirely on 60 years of UU-liberal religion and friends). Jennifer, I hope the book is useful to you in your being both (UU and Christian) journey! There are so many of us, of all different types, out there.